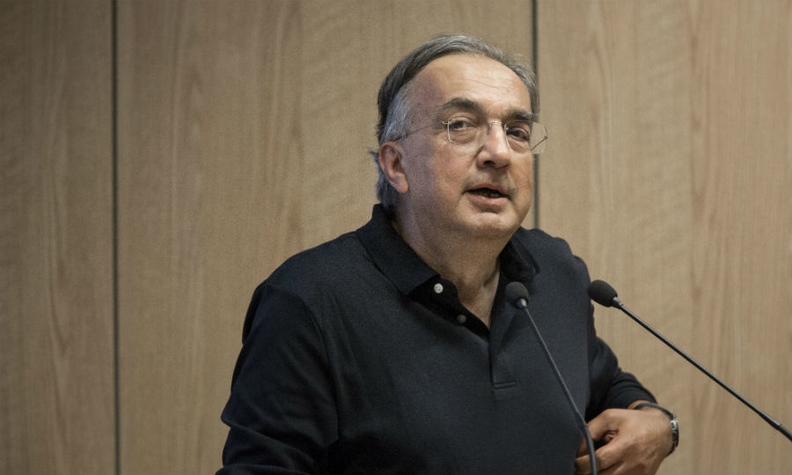 MILAN --Sergio Marchionne enters the final stretch of his career at Fiat Chrysler Automobiles with a daunting mission: prove wrong the doubters who question how he can make the automaker’s $5.29 billion in debt disappear by the time he steps down in two years. Aiding Marchionne is a product shift to more profitable models such as Jeep SUVs and Dodge Ram pickup trucks instead of less popular sedans in the U.S. The line-up provides a buffer as industry conditions turn challenging, with growth in the U.S. and China topping out or slowing. Investors have taken note: the stock listed in Milan has surged 62 percent since the carmaker raised its full-year forecast in late October, and analysts’ average share-price estimate has jumped 11 percent to 8.26 euros a share. The stock, which has been trading higher than that this year, rose as much as 4 percent to 9.63 euros on Friday, the highest intraday price since Oct. 20, 2015, and was up 3.6 percent as of 10:14 a.m. in Milan. The carmaker is likely to outline how it will reach the goals when it publishes last year’s figures at the end of this month, the people said. Fiat declined to comment. But even with Marchionne’s improved strategy, the vast majority of analysts still expect the manufacturer to fall short of the targets. These include generating as much as 5.5 billion euros ($5.82 billion) in adjusted net income, almost three times the 2015 figure, and turning a projected 5 billion euros in net industrial debt into at least a 4 billion-euro cash pile. The company could miss the adjusted-net figure by 42 percent and carry over 3 billion euros of debt, according to analyst estimates compiled by Bloomberg. Marchionne, 64, is no stranger to public skepticism. Critics of his lofty goals have called them “fantasy land” and “not credible." The CEO himself backtracked a year ago, when he stopped promoting a goal of 7 million annual group deliveries by 2018, which compares with Fiat Chrysler’s 4.6 million vehicle sales in 2015. Deliveries could be largely flat at about 4.8 million vehicles annually this year and next, research company IHS Automotive estimated in November. Marchionne is set to receive a $12 million payout when he retires at the beginning of 2019, and is entitled to stock currently valued at about $43 million if the carmaker reaches 2018 financial goals including the profit target. He also maintains that eliminating its debt burden will allow the company to play a stronger role in what he sees as the inevitable consolidation process in the auto industry.